Despite the investment of a shedload of money into adoption promotion over the last ten years, we haven’t been able to move the annual adoption rate by rescue groups to even half the required amount of 200,000 adoptions per year. Rescue groups cannot do the heavy-lifting required to save all the pets at risk of death in the pound. It’s not physically, emotionally or financially possible. In case you ever wondered - why rescue in Australia is burning out. ... who don't rehome pets, or only work with the most adoptable pets, or who operate with insufficient capacity, or a lack of proactive programs... direct their pets into rescue. While the pounds have a paid workforce and government employee benefits, most rescues are based on volunteers (foster care). Rescue's are expected to take these pets for free. They may even have to pay for the 'privilege' of rescuing these pets from certain slaughter. And the rescues are expected to pay for all vet work for pets. Pounds who use rescue in this way are able to claim accolade for reduced 'kill rates' - even when they may not adopt a single pet themselves. ... are paid by local government agencies. They are also able to solicit for financial support in the valuable donor and bequest space. More than $240 million dollars is generated in revenue every year by these groups. But their 'kill rates' have still been notoriously awful. 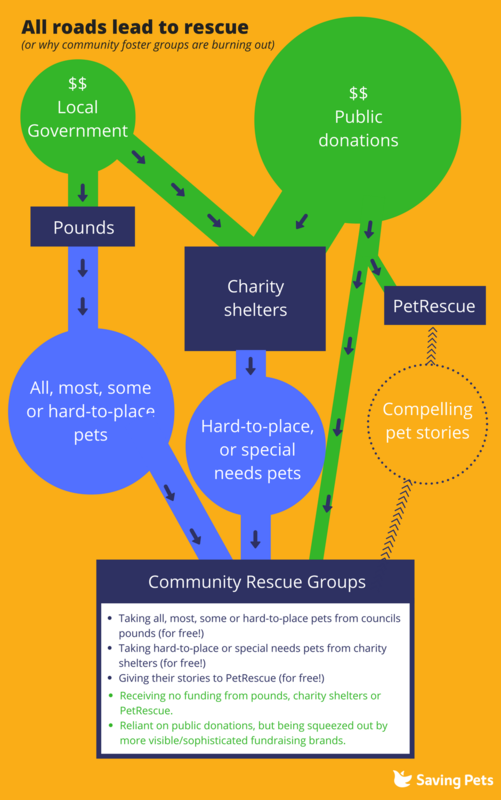 To reduce community criticism charity pound providers are now engaging rescue groups to take overflow pets (the pets at risk of being killed when they deliberately run their shelters at overcapacity during busy times like holidays), special needs pets and any pets that are taking too long to adopt. In short - the hard-to-place animals. Rescue will take these animals to save their lives. However, the burden of caring for a pet who will take a long time to place, or need specialist care is obviously enormous. is now a major player in the animal welfare fundraising sector, raising over $1 million dollars in revenue last financial year. Their brand is based on the idea that they are helping community rescue; this ensures that people wanting to help small groups will donate to them. There is only one problem with this - exactly zero dollars is passed onto the groups doing the rehoming work. Where does this leave volunteer community rescue groups? Pounds use their services for free. Charity pound providers use their services for free. 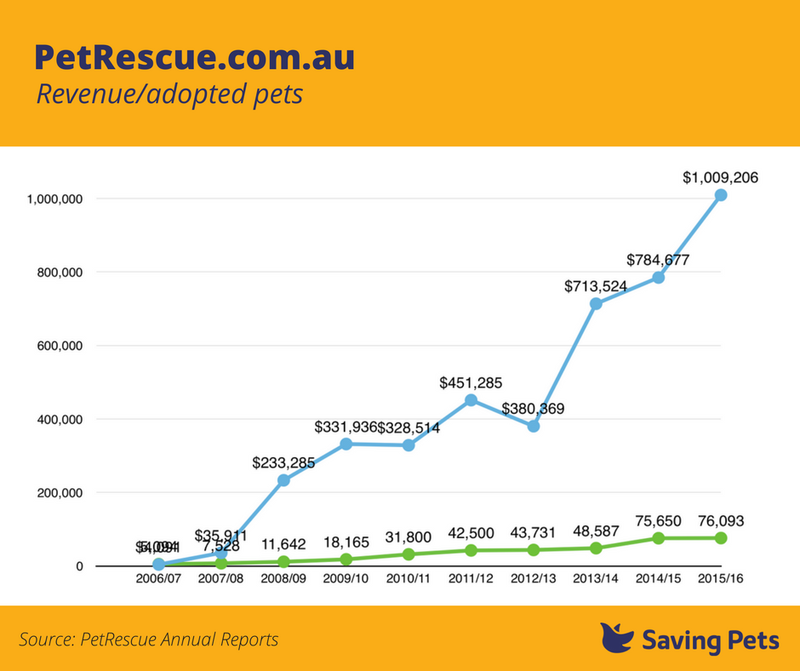 PetRescue are using their intellectual property for free. And none of these groups are PAYING for the rescue groups to continue to operate. Take, take, take - and no give. So if you're a rescue group feeling burnt-out and financially poor, there's a very good reason for that. It's because you're working in a system which could result in nothing else. We can't wait another ten years before we choose a real solution to pound killing. **Please note I'm no longer affiliated with PetRescue.